"You can vary this easy rice side dish by adding different spices or meat." In a large bowl, stir together the white rice, cream of mushroom soup, and vegetable broth. Blend in the onion, mushrooms, parsley, oregano, melted butter, salt, and pepper. Transfer to a 2 quart baking dish, and cover with a lid or aluminum foil. Bake for 35 to 40 minutes in the preheated oven. 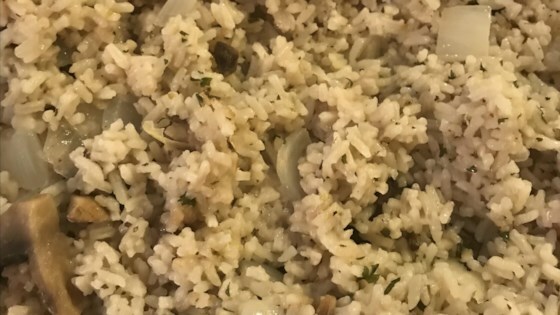 If the rice is looking dry before it is tender, then pour in a little water and continue cooking until rice is tender.